Right now I'm a huge peach lover. I don't know what it is, I've just suddenly got into them. Peach cobbler, peaches and ice cream, but you know what else is sensational? 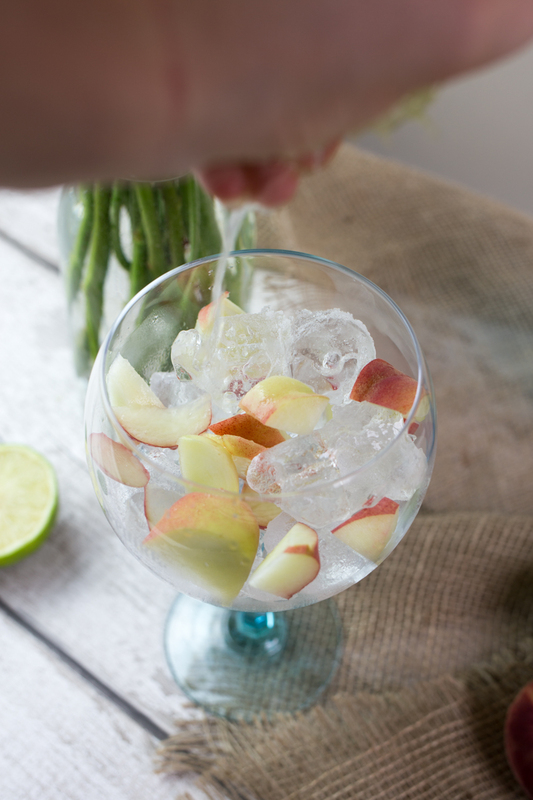 Peaches and gin. Yep, the two just marry so well. 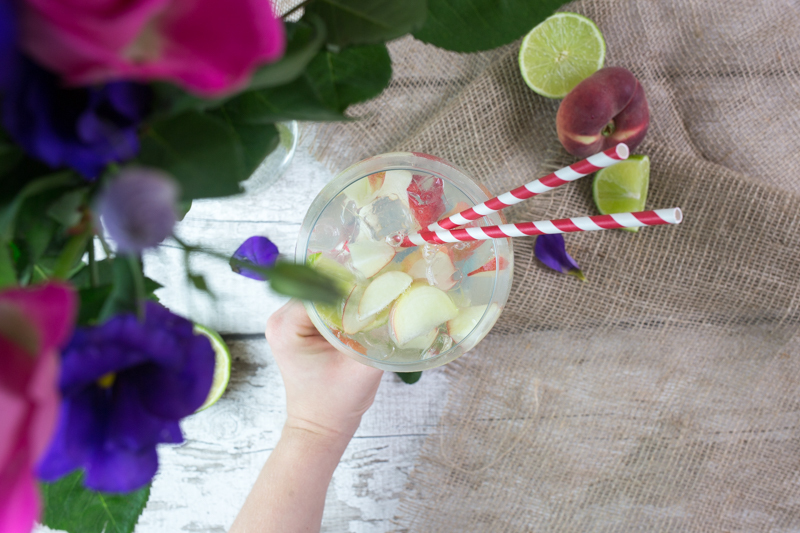 Peaches are such a sweet, nectar fruit that when added to a highly concentrated botanical based gin, it takes to those botanicals so well. This is why they are great with a gin like Bombay Sapphire. 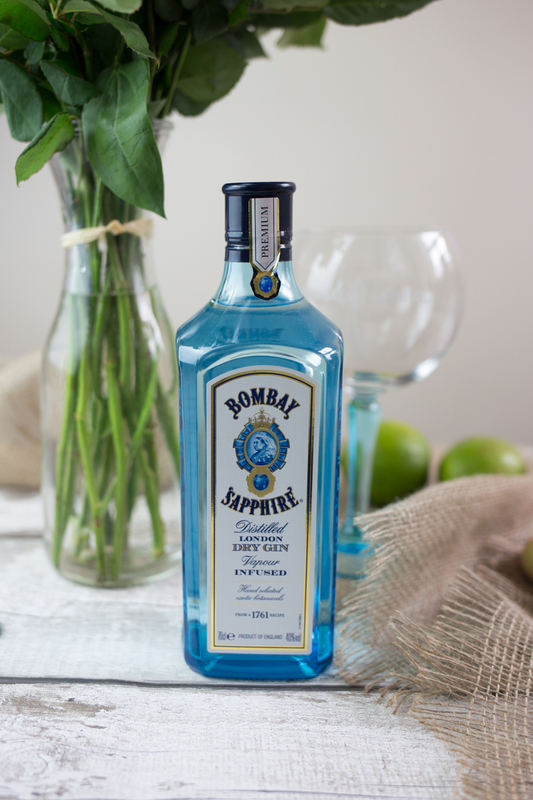 If you have read my previous post about visiting their distillery, you'll know that Bombay Sapphire is made with 10 different botanicals, and is a slightly sweeter gin than others and that it's the oils in those botanicals that fuse with the alcohol. 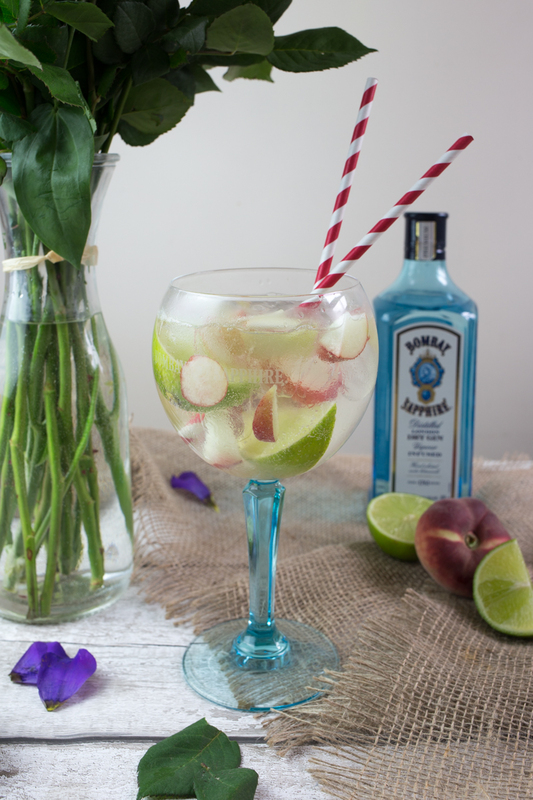 So an oily fruit like peaches are perfect for it as it enhances those botanicals, bringing out the flavours of the juniper berries, almonds and coriander even further. 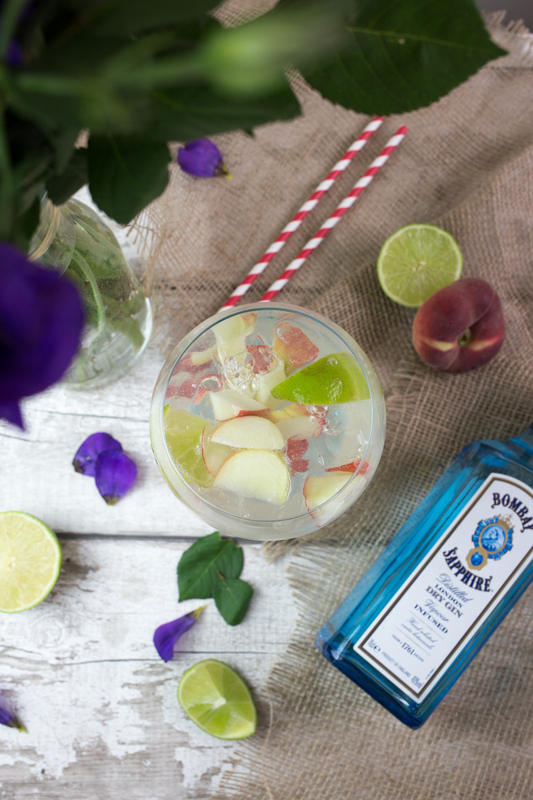 To celebrate their upcoming public event in London; The Grand Journey, they challenged me to make the perfect summer cocktail that would work wonderfully at a picnic and so what better than something light, fruity and sweet? 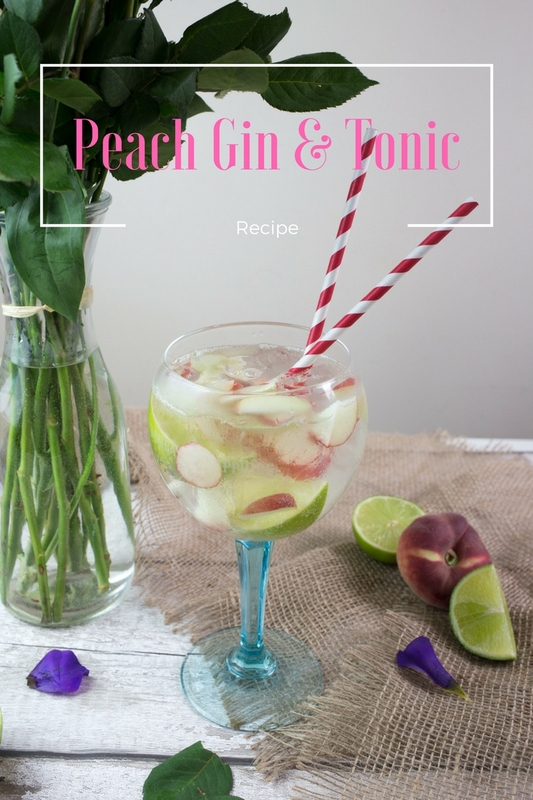 At a picnic you want something quick and easy that you can make outside, so I chose this as it's simply gin and tonic for liquid and only two fruits. Nothing to complicated or heavy in your basket. Now what is the Grand Journey I hear you ask? Well they are hosting a week long event - The Grand Journey in London which is actually a "train ride" to all the countries where to botanicals grow to discover their origins. They've parked up a train at the Banking Hall in Bank, London, between 17 and 23 July and you take a (stationary) journey around the world. But thats not all, The Grand Journey is also a culinary delight with Tom Sellers of Restaurant Story fame serving food pairings along with their gin cocktails. I'm going to the Grand Journey tonight so hopefully I'll be able to come back and add in some excellent picnic food pairings too. 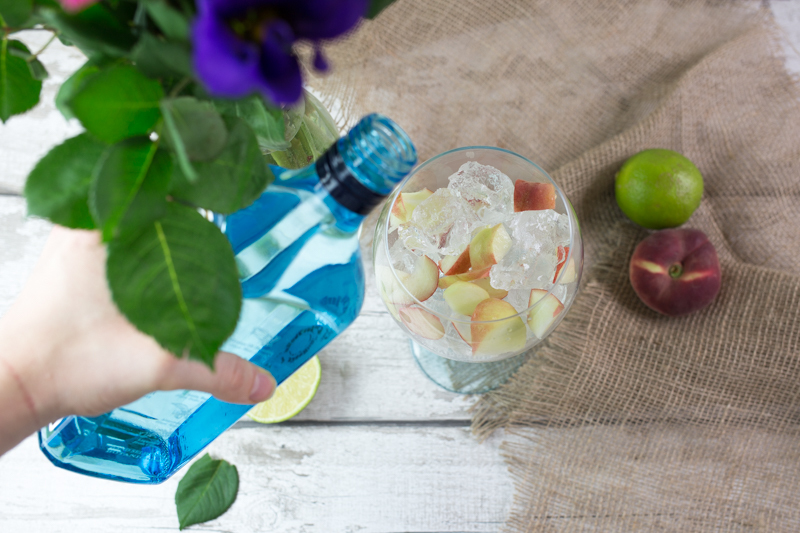 At the distillery, they are all about local produce, and making sure everything is fresh and the best quality, so if you can, try to get your fruit from a local market or seller. I always try to buy from an independent grower to get fresh ingredients, plus I'd also rather my money go to them than a big conglomerate like Tesco! Fill a balloon glass with cubed ice- don't be shy with the ice. Slice the peach and add into the glass. 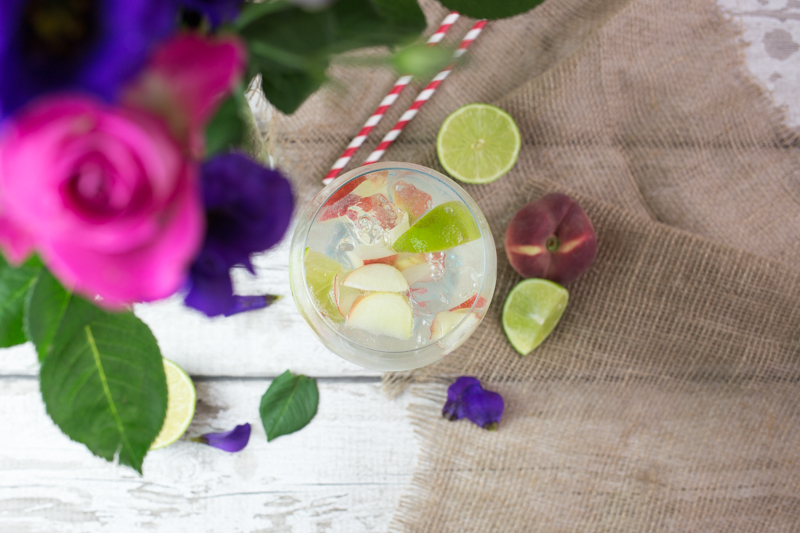 Pour the gin over the ice, then the tonic and finally squeeze in the lime juice in. Slice the other half of the lime and add into the glass, stirring to combine. Serve immediately. If too sharp or you like you drinks extra sweet, you can add a dash of sugar syrup to taste. And there you have it, easy as pie. Very quick and simple, yet so refreshing and sweet. I may have drank this one, and then made myself another as I sat outside working. 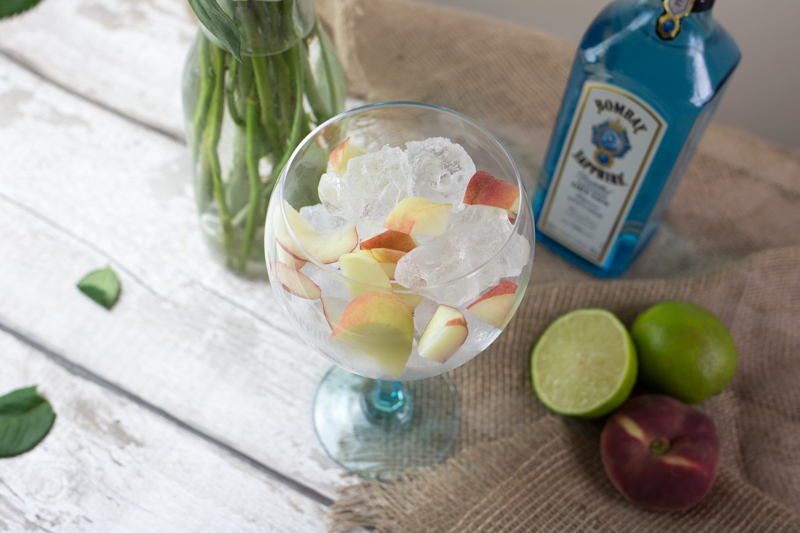 So on your next picnic, grab yourself a bottle of Bombay Sapphire, a punnet of peaches and get drinking in the sun. Don't forget to check out the Grand Journey too. It's set to be an amazing event. Sounds super refreshing and I love those glasses!